For the last three years I've wanted to take photos here while the lavender was blooming. It's outside a photography studio along a busy road and therefore outside my comfort zone of somewhere I'm comfortable taking photos with a tripod. There is also a very small window for the lavender, and I wanted to get it right at its peak. The perfect evening finally came a couple weeks ago when I got my Mom to help me out with photos. She did a good job of keeping the oncoming traffic out of the frame, and if you ignore the neon lights from a nearby nail salon, you might get lost in the lavender dream I'd been imagining. And I think I only got honked at three times. Not bad. So glad you got a chance to take these photos, it is the perfect background! Love your blush-colored outfit as well. You look stunning! That lavender is gorgeous, especially with your neutral look. I love lavender - it doesn't bloom anywhere that I've ever lived, at least not on a large scale, so I saw it for the first time when I visited Provence when I was fifteen. I hadn't really wanted to go to Provence, which sounds silly now but there's a long story about why. The lavender, though... It made it all worth it. And it was definitely worth getting honked at a three times to get these shots because honestly, the purple blooms are so lovely and perfectly compliment the soft colours in your outfit. Speaking of soft colours, the grey shade of your jeans is exactly what I've been looking for in a pair of grey jeans for what feels like ages. They're gorgeous on you and I may just need a pair myself! I'm so glad you got to take pictures here! You look gorgeous! Hooray! Moms win again! I love the way these photos came out--just lovely. And the pale pink and grey combo is amazing! Love the outfit and your mom did a fantastic job in a perfect setting. I love lavender and this neutral look. 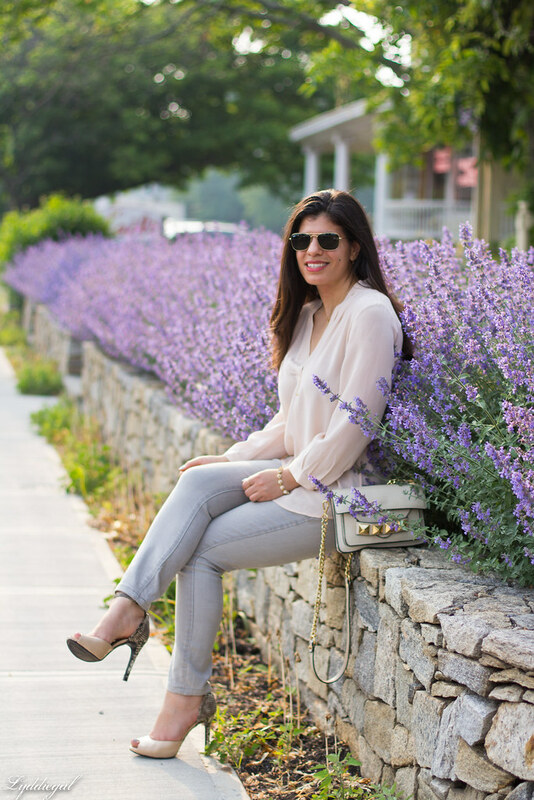 The lavender is so pretty and I love this neutral outfit! Beautiful! Well worth being out of your comfort zone! Love these lovely muted colors! That clutch is so pretty! 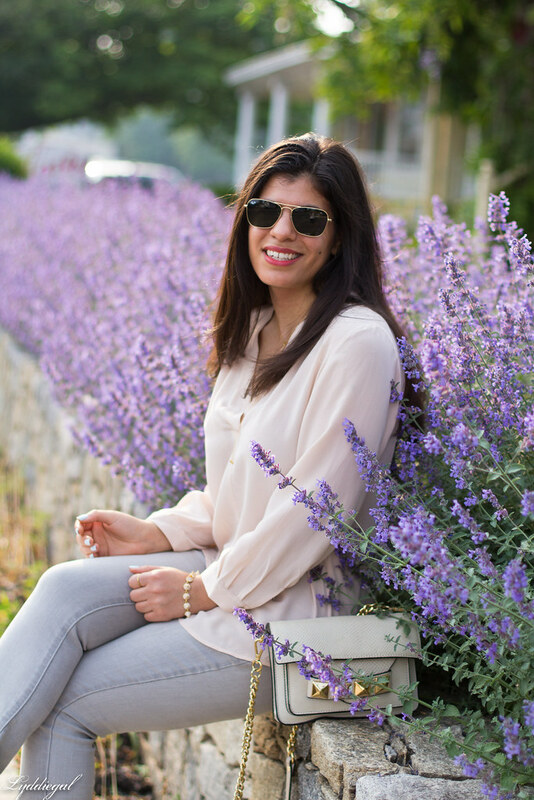 That is a lovely spot for photos - and the neutral outfit is perfect with the lavender! Glad you managed to get photos in that spot after wanting to for a while! Your mom did a great job with these photos and the lavender background is perfect with this outfit! Hope to see you Thursday for TBT Fashion linkup. I love how getting honked at only three times is an accomplishment. So glad you got to take pics in front of this pretty, pretty setting! It's so gorgeous! I'm definitely feeling the field of endless lavender flowers vibe. Loving your pants, too. Always so classy, Lydia! Your mom got great pics! I love the soft, blush pink against the lavender--once again you coordinated beautifully with nature :) I wish you could transmit the smell across the internet too; I love the way lavender smells! Your mother did a great job with these photos. :) Lovely outfit, and of course I also love lavender. We both are talking about it today. You have styled this look to perfection, gorgeous!! Love these pics with the lavender. I'm so envious! I wish we had beautiful lavender growing like that anywhere where I live! Sadly, it's all dry grass and dirt! Equally beautiful is your soft color palette. Love this outfit so much. Wow you styled pastels perfectly! The location is so beautiful and the pictures are breathtaking! Gorgeous look! I am so impressed you take your photos with a tripod! You do an awesome job! we use a tripod to, but its alot easier with two of us! I am impressed! so glad you were able to catch the lavender :) Looking fab as always! Such a chic look and I love the background. Have a great day gem! I love the soft colors here! Such an effortless, chic and polished look! You look stunning! 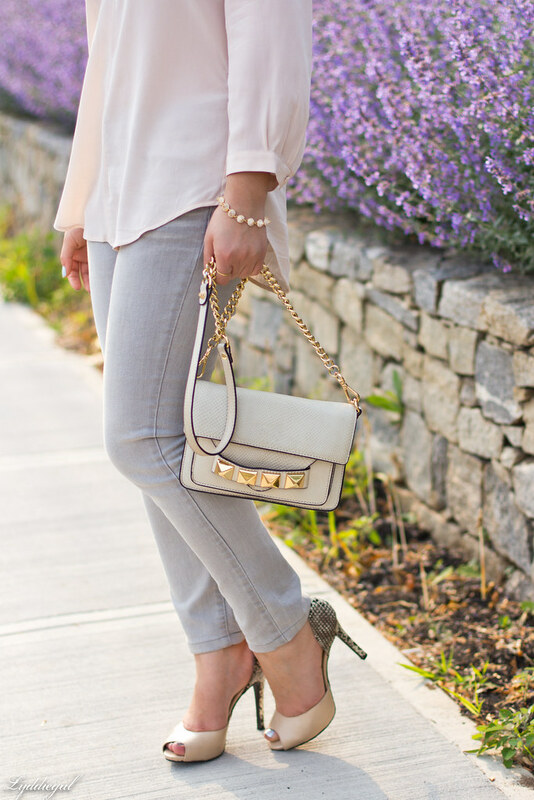 Loving the soft neutrals and that bag is fabulous! What a beautiful background! It makes me want to plant lavender in my garden! It compliments your outfit so well! Wow, the lavender really does make for beautiful photos, especially with your soft colors. Love the blush and grey. These photos are gorgeous and you look stunning! The lavender is so beautiful. I LOVE this outfit! I've been obsessed with this color combo - grey and blush. 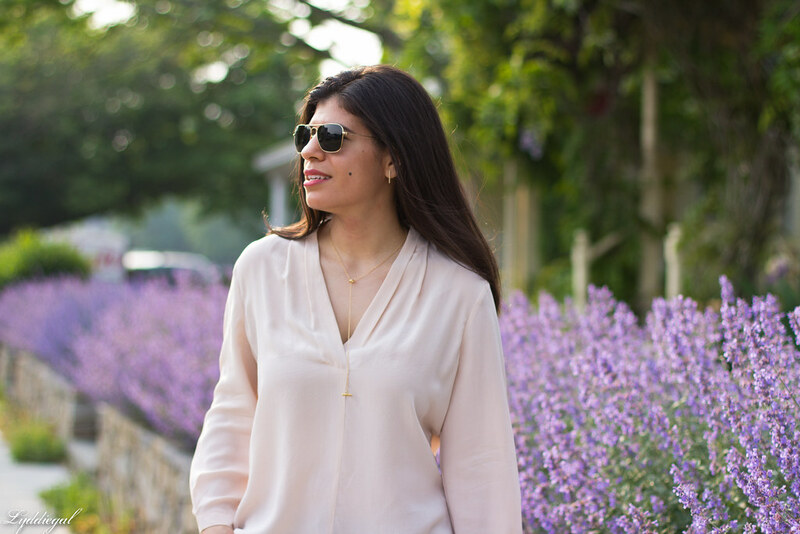 It's the perfect outfit to wear next to the lavender. Beautiful photos! I really love this look with the lavender in the back, and those shoes!! Beautiful ! i would have never seen the neon if you had not mentioned it.